Generic Handlers (.ashx files) deployed to the _layouts directory are not directly supported by Visual Studio 2010 SharePoint projects like custom .aspx application pages are. This post will cover how to add them to your Visual Studio project and deploy them properly to the ISAPI folder. Visual Studio Item Templates for Generic Handlers (.ashx files) are not directly supported by Visual Studio 2010 or 2012 SharePoint projects. I contributed an ASHX ItemTemplate to the CKSDEV team that is now included in the 2010 and 2012 versions of the extensions (see http://www.lifeonplanetgroove.com/2013/04/30/ashx-generic-handlers-and-sharepoint-now-in-cksdev/). The manual approach below is still an option, but the CKSDEV approach makes it much more seamless. Special thanks to Wes Hackett for merging the contribution. If you try to Add New Item… and select the Web or SharePoint categories in a VS 2010 SharePoint project, you won’t find Generic Handler anywhere. Choose the Application Page template. In the name box, enter a name for your file, with an .ashx extension. If you want to reference other SharePoint assemblies in your code-behind, you will need to add an @ Assembly directive for each DLL. Add a using statement for System.Web. You probably don’t need the using statement for Microsoft.SharePoint.WebControls, so remove it. Change your namespace if necessary. 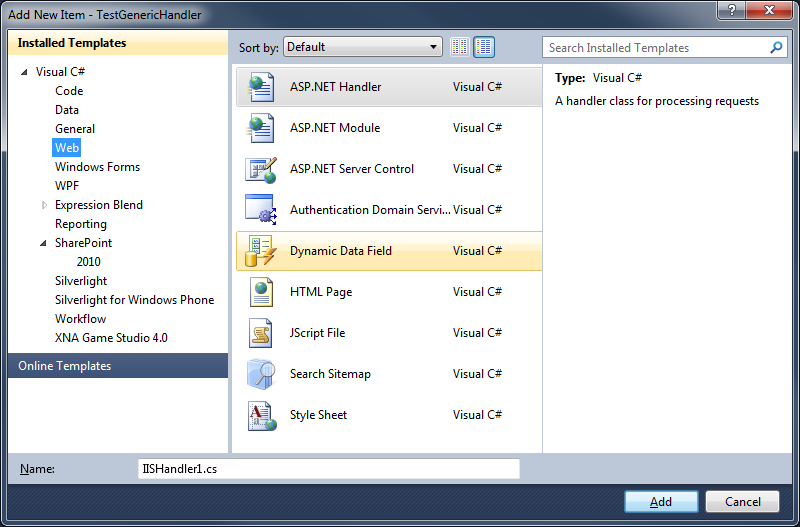 Change the class to inherit from IHttpHandler. In the Solution Explorer, delete the ashx.designer.cs file, it is not needed. 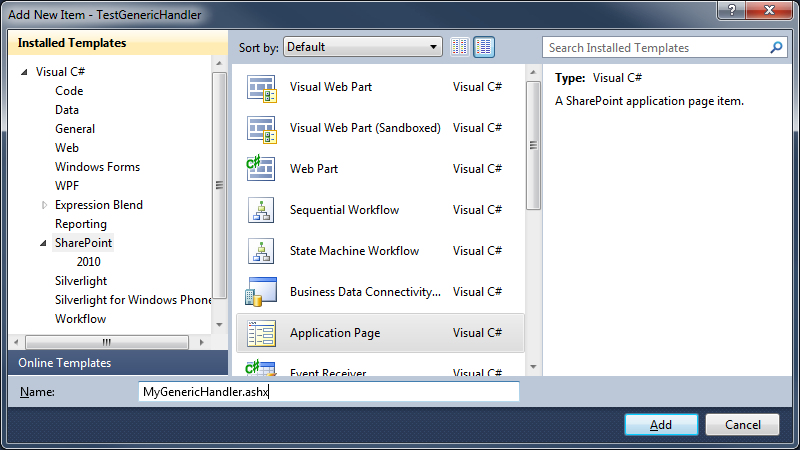 In the Solution Explorer, click the .ashx file, and in the Properties pane, set the Build Action to Content. 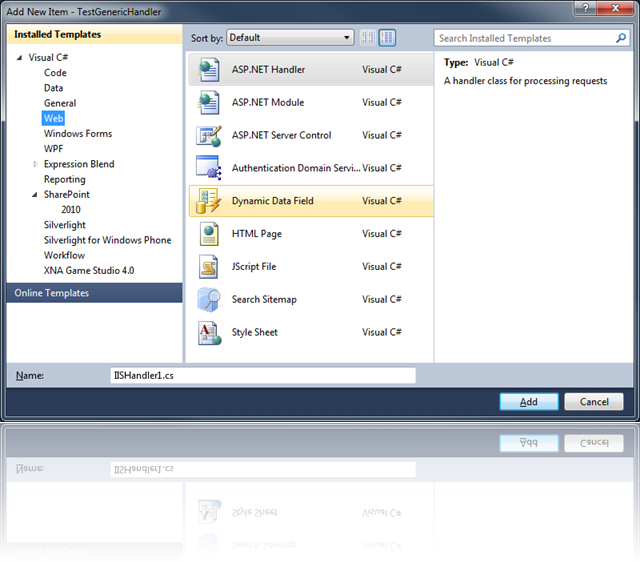 In the Solution Explorer, click the .ashx.cs file, and in the Properties pane, set the Build Action to Compile. Excellent.. I was looking for this from long time. Thanks for a full explanation and steps to do this. I don’t know of any other post pointing out the TokenReplacementFileExtensions. That was the missing piece for me…..